New DfE data released yesterday shows that education and training rates for 16-17 year olds in London and the South-East are diverging. One-in-twenty more young people in the capital are now in education or training, compared to in the adjacent region of the South East. Differences are only small (hence the non-zero axis that I hate). 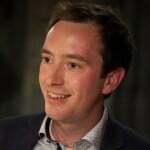 However, it seems that although the gap between London and the South-East began to close in 2016, this year, a small fall of 0.8 percentage points in the South-East and a slightly larger increase in the capital, combined to widen the gap once again. The changes mean that 16-17 year olds in the capital are now almost 6% more likely to be in education or training compared to their counterparts in the South-East. The capital has long been ahead when it comes to educational achievement. However, these figures suggest that differences go beyond exam attainment. On the other hand it’s important to acknowledge that these trends are likely to reflect national patterns in different ethnic group’s educational participation. 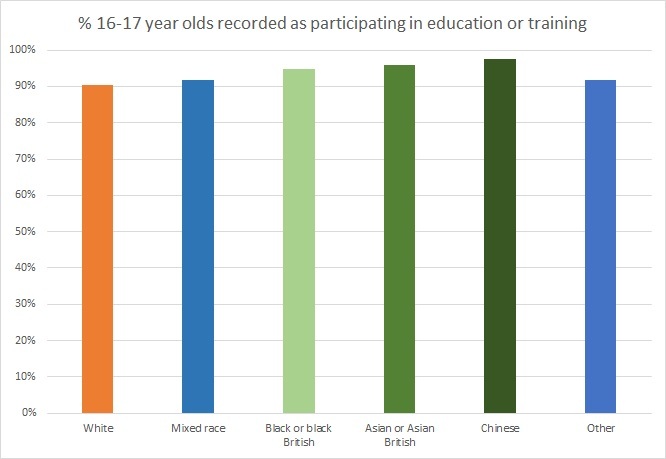 Yesterday’s data showed that 96% of Asian/Asian British 16-17 year olds are participating in education, compared to only 90% of their White British peers. The capital’s higher concentration of ethnic minority pupils who participate at higher rates is likely to go a long way to explaining the regional trends.